CBD Drink: CBDfx Chill Shot 20mg Review, Everything You Need To Know. We had been burned with some really nasty tasting products in the past, but the CBDfx CBD chill shot is absolutely yummy! It tastes like someone opened up a lemonade stand and threw in some CBD, and packaged it for your consumption. Beyond that, we were very pleased with the effects as well. The CBDfx CBD chill shot joins the growing drinks category, yet another way to consume CBD. We have tried a few similar types of drinks before and have been disappointed, but this one definitely warrants a full review. Read on to find out why. CBDfx offers a wide range of products. Their roots are in vaping, but they’ve quickly branched out to create other high-quality CBD products, like gummies, capsules and vape pens. They’re based in L.A. and since they opened shop in 2015 they’ve been known for being a brand that is serious about their products’ quality as well as their customer service. This isn’t your regular CBD drink. In addition to 20mg of full spectrum CBD, the CBDfx CBD chill shot comes with a variety of herbs and vitamins. Featured among them is L-Theanine, a powerful amino acid found in teas. It primarily functions as an anxiety and stress reliever, going hand in hand with CBD. CBDfx extracts their full CBD from organic, non-GMO plants grown in the US. This is a 2oz shot that is rich in terpenes and cannabinoids. 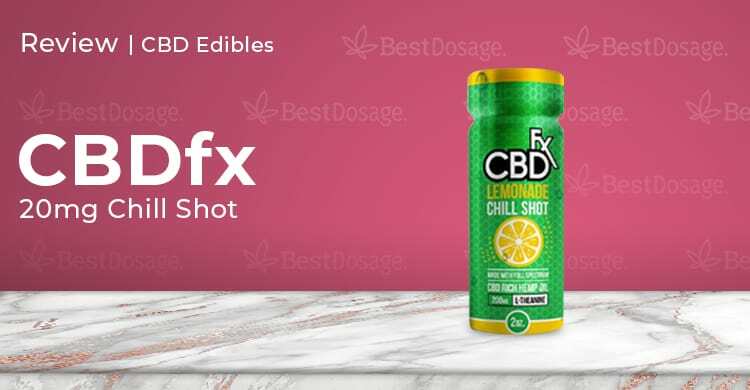 The CBDfx CBD chill shot only comes in lemonade flavor as of this writing. For their first foray into CBD drinks, CBDfx chose to go small. This a shot of liquid, so you aren’t going to be sipping on it. Just shake it thoroughly and take it in 1 or 2 chugs. They’ve packaged it similar to those little 5-hour energy drinks but in a highly upgraded manner. The bottle looks great and feels sturdy in your hand. All the ingredients are clearly labeled and the image of the lemon on the front screams “drink me right away!” Which we were all happy to oblige. Now, getting it open was our first conundrum. It was hard to find the spot to begin unwrapping the label, almost like they were keeping it under lock and key. Finally, we did find it. Cracking open the CBDfx CBD chill shot, everyone on the team taking it for a test run agreed: yum! The lemonade flavor is absolutely delicious. The only caveat being that one of them was left out and thus wasn’t “chilled.” The flavor quality plummets in that case, so make sure you do have it refrigerated before consuming. This is pretty easy, as the CBDfx CBD chill shot is just that – a shot. You drink it all in one go and it is premeasured with 20mg of CBD. Now, you have to remember that your body doesn’t absorb all of that CBD when ingesting through your stomach. So don’t expect this to equal 20mg of oil or vape. This shot is a good start and then you can supplement it through the day with more as per your needs. The plus side is that the effect also stays with you for a while, typically around 3-4 hours and sometimes more. After enjoying the flavor of it, we had to wait for the effect to kick in. For an edible, it can take some time. For some, it took only 30 minutes, but most of us felt the effect closer to an hour after consuming. Different members of the team felt different things, perhaps because we all take CBD for various ailments and purposes. There was definitely an energy kick to it, but nothing like the way-too-high feeling of an energy drink. It was more of a serene but awake feeling. This product has a number of relaxing herbs and vitamins among its ingredients (full list below), so it is no surprise that most of us felt a calming effect. For those taking CBD for anxiety, this really hit the spot. Water, natural lemon flavors, citric acid, L-theanine, CBD rich hemp oil, soy lecithin, sodium chloride, sucralose, sodium benzoate, and gellan gum. L-Theanine – This is a potent amino acid in improving the body immune system, tissue repair, and healing. It helps in energy production, thus increasing mental focus, motivation, and assist in stress reduction. Lemonade Flavor – Used to make this formula delicious, thus helping the consumer to enjoy while acquiring the health benefits. Citric Acid – It plays a role in the body by boosting the health and immunity, as well as in soothing pains and inflammations. Soy Lecithin – It plays a number of functions in health improvement. It helps in cholesterol level control, improves kidney health and also boosts liver performance. Sodium Chloride – It plays a role in enhancing nutrients absorption and transportation in the body. Our experience with the CBDfx with customer support has always been a good one. They stand fully behind their products and give you a variety of contact options. You can send them an email, call them on their toll-free phone number, and engage in live chat on their site. Responses were rather speedy, and their customer reps were friendly and helpful. You can also contact them via various social channels, with Instagram being our favorite. Free shipping on all orders in the USA – can’t beat that! Plus, CBDfx also offers a great tracking system for everyone out there like me who loves tracking their packages. $6.99 per chill shot, as cheap as $4.50 if you buy the 12 pack. The only thing is that this didn’t exactly feel like 20mg of CBD, due to it being absorbed in the stomach. This is a product you use as part of an overall CBD lifestyle and isn’t a stand-alone, which is why the score isn’t higher. That’s just a result of what it is, and it’s a knock on the product or its efficacy. Overall the CBDfx CBD chill shot was a hit, and several of us have already incorporated it into our routine.